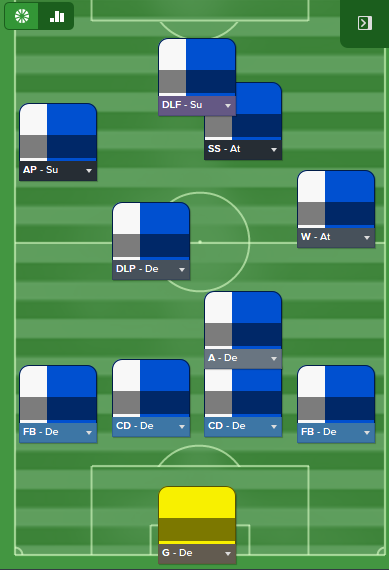 Pre-season was a good chance for me to evaluate the squad and experiment with formations/tactics. I alternated between a 4123 DM Asymmetric AML and a 4321 Asymmetric AMC formation (below). It's very hard to gauge the success of systems during pre-season. Some teams were already match fit when I got to play them (e.g. MŠK Žilina) and I was playing with a mixture of youth and experience. What I did notice was that the Wing Backs in the 4321 were extremely effective at providing the width (especially the WBL). The Deep Lying Playmaker (DLP) was also getting the protection he needs to dictate the game with a Ball Winning Midfielder (BWM) and a Box To Box Midfielder (BBM). In the 4123, the DLP was often outnumbered and his game was being disrupted by closing down and tackling. A playmaker should have the license to do what he wants! An awful performance at Ross County was the only blemish in what otherwise was a great pre-season. We came out with no major injuries and the squad was ready for the challenges ahead. I was also set on 4321 becoming the preferred formation, with a Control mentality and Fluid system. This was getting the best out of Nemanja Antonov at WBL and also making good use of captain Kim Källström at DLP. Budget was extremely low this season, the major outlay was Taye Taiwo (for £13k) to compete with Antonov in the WBL spot. I notice huge demands on the WBL within my system, and a constant rotation policy will need to be adopted to keep players fresh. 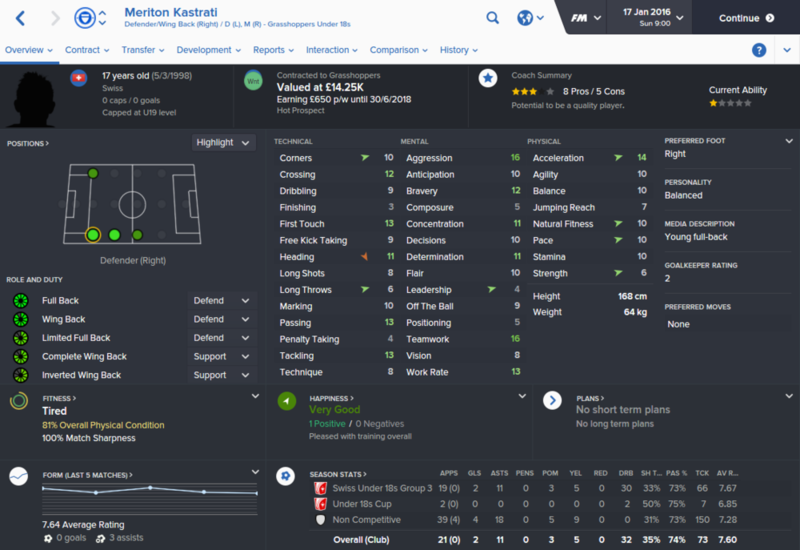 I also needed cover for Kim Källström in the DLP role and a player who would also be content to play any of the other central mid roles (BWM and BBM). Up step Daniele Conti! Now you will probably wonder why I am bringing in a 36 year old...especially when I bang on about my youth project! The answer is simple: to tutor and mentor the younger players on the pitch. I will focus a blog post in the future about this. The other two signings are cover that adhere to the general philosophy of 'developing players through the youth system'. They have not featured much in the 1st half of the season, but it is expected that they will contribute more and more as we continue Season 1. There were no notable sales in the summer. Although I did resist the temptation to sell Munas Dabbur to SV Weder Bremen, instead promising him that we would qualify for Europe this season! This seemed to focus him back on GCZ for a bit, but since December he is getting impatient (more on this later). The performance in the league has been particularly encouraging. Apart from a pretty bleak August, where I only scored 4 goals in 6 games, I have been largely performing. The 4321 has been solid and I fluctuate between a Counter or Control style depending on the fixture. I also modify Team Instructions as to how we keep possession and the general shape of the team on a game-by-game basis. The only teams I have yet to beat are Luzern & Young Boys, so I know for sure that I will need quite an in-depth analysis of their ProZone performance before facing them again. So far, 6 of my players have played every minute of the Swiss Super League campaign (below). Yoric Ravet impressing in the Inside Forward (IF) role and Dabbur improving as the season continued. Those that have read this blog will know that the long term strategy is making GCZ sustainable and pushing through youth products into the 1st team. Some will not quite make it and be sold but the overall aim is to be able to play at least 8 Homegrown GCZ youth products in a match day squad from Season 9 onwards. I would like at least of these 5 of these players to be of Swiss nationality. More on my plan for youth here. All 3 players now have long term deals at the club and I expect them to compete regularly in the 2nd half of this season. I am already thinking 1-2 seasons ahead about who they will replace in the 1st team. Barthe, Dabbur & Ravet? At GCZ, I must not stay attached to the current 1st team. I need to sell at a time when their sale value is close to their peak. However, hard it is. The Winter months have mostly seen me discuss the interest from Germany and Italy in Munas Dabbur with the Press. Munas is the team's top scorer with 12 league games in 18 games. Munas has a contract until 2017 and will most likely be sold in the Winter transfer window OR the Summer of 2016. Keep updated as to what happens on my Twitter account. In the meantime, I have signed a pre-contract agreement with Airam Cabrera. A Spanish striker with modest all round abilities. He should provide valuable experience next season, with (hopefully) a consistent amount of goals. Well, that's my Season 1 Mid-Review done. Thanks for reading if you got this far! The GCZ save has been very enjoyable so far - FM16 is a really enjoyable game. Let's hope I can maintain my league form and do well in the Swiss Cup.